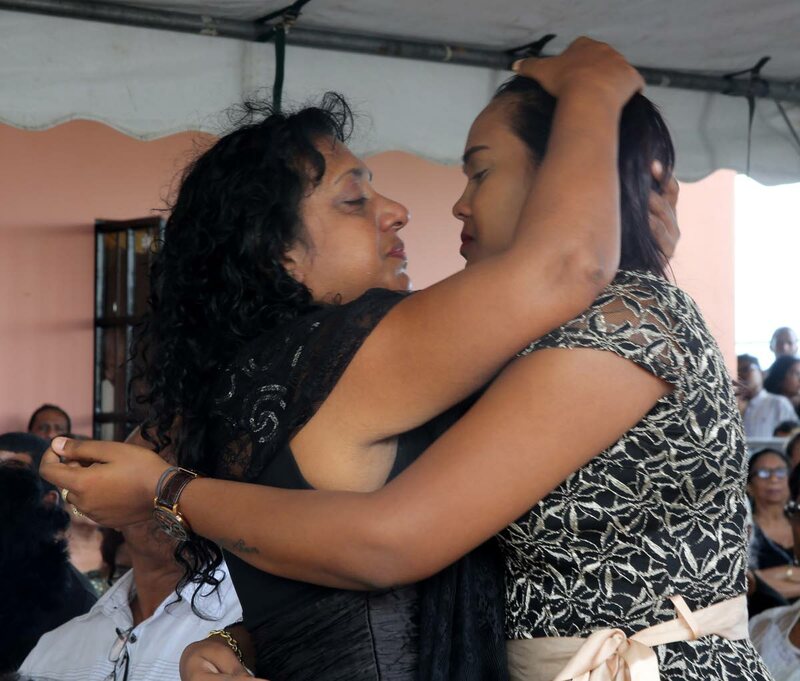 Unable to contain her grief as she faced her husband’s casket, Krystal Chankar-Khan fled through the crowd of mourners gathered to pay their last respects to Brandon Joseph Khan yesterday. When relatives were able to coax the young mother back to the funeral at the family’s Agostini Settlement, Chase Village home, she delivered a eulogy that left many people in tears, as she spoke about the love story she and Brandon shared. Khan, 23, was murdered last Friday and his body found dumped in Chickland, Freeport, on Saturday morning. He had been shot in the head. His car was found parked a short distance away. Khan and Chankar-Khan married in July last year and had a four-month-old son, Liam. Relatives said Khan was studying to become an emergency medical technician. Chankar-Khan said, “He was educated, charming, hard-working and Brandon also had a romantic side no one knew about except me. She broke down several times and had to be comforted by her parents, Brenda and Shawn Borneo. Khan’s mother Marilyn Khan said she believes her son’s soft heart led to his death. Despite her grief, Marilyn said she forgave the people who murdered her younger son. “Somewhere along his journey, he got distracted and he went astray. But his death was not in vain. Those people thought they killed my son, but they actually broke the chain and set him free. The cycle has been broken. They did him a favour. He can no longer face any guilt or any influence. Khan’s cousin, Arisa David, 25, was murdered at her Chase Village home on January 2. Her estranged common-law husband Joseph Bennet appeared in the Chaguanas Magistrates’ Court charged with her murder on Monday. There has been no link between the killings. Reply to "Murder victim’s mom speaks forgiveness"